Well the rain did come and everything went out just as a client, Mochizuki san arrived for five days fishing so it was into the truck and off. A friend of mine has a station in North Otago with the headwaters of a rather good rainbow stream running through it. This stream is usually considered a spawning stream and in Nov/Dec is full of post spawning rainbows that are ridiculously easy to catch but after xmas most of them have dropped back into the main river, what is left is a resident population of maybe a couple of trout per pool and others scattered through the faster water. They were generally not easy as the water levels were quite low but we picked up many fishing blind with a dry in the faster water and if they were rising they became much easier. In the mornings we would watch a pool for a while to see if anything rose before fishing it but anytime after 1300, just like the Mataura mayflies would start coming off. These were a mixture of deleatidiums and a much larger mayfly which I have not been able to pin down, I thought they were coloburiscus but they are more of a march brown type. When we first fished this stream we used Royal Wulff, Humpy type flies but over the years we have found a traditional Adams #14, especially when there is a hatch on to be the best and we also use it for fishing the ripples blind. These trout range from 3.5 to 4.5lbs, the biggest was 6lbs which was caught by a Yatagawa san who also several years ago caught an 8lbs brown right up in the headwaters. Mochizuki san had four great days and we arrived home tonight, he goes tomorrow and then I am off overseas for three months. I had an offer I could not refuse and am going to China, Mongolia and will be spending about two months in Russia via the Trans-Siberian railway, fishing will be involved although I am not exactly sure where yet but Siberia is a possibility. Then I will be based in London and have had some time organised for me on the Test and the Itchen, the thought of treading the hallowed ground that Halford and Skues walked and fished, will I am sure be the fishing highlight. There have been great dun hatches everyday since my last post, it doesn't seem to matter what the conditions are like and the start time varies depending on where you are. There have even been hatches in east winds, yesterday Graeme and I hit a huge rise to duns while the east wind was whistling downstream so much for the "When the wind is in the east the fishing is the least". I have not come across a true spinner fall all week myself, I am sure there must have been some but not where I have been over the last five days. We are still using #18 flies and I think I will stay with them, the #18 CDC flies are just as easy to see as the #16. The rain stopped the rise this afternoon and I am not sure just how much rain there is going to be, there has not been a lot and we are due for some. At this time of the year as long as conditions remain stable the trout will keep rising but if the river goes out the fishing never seems to come right again. I think the trout think enough is enough and go into spawning mode, even though you can find some rising here and then it is never as good as before. It was good to catch up last night with Bob and Diane Nutter, repeat clients from previous years but unfortunately I was unable to guide them this year due to email problems, emails may disappear into cyber space OK but that doesn't mean they get to where they have been sent. The windy weather from the west has continued since my last post but the trout have been rising in the afternoons and as long as you can find shelter you will get some good dry fly action. Although it is amazing what awful conditions they will rise in, I got hit with a really bad squall when I was guiding Igarashi san on Friday, the trout kept rising and the birds were picking off mayflies but it was impossible to cast even though the trout were rising almost under his rod so we stumbled back to the truck and raced around to a more sheltered spot. Yesterday though was superb, no wind, cool, cloudy and the trout started earlier than usual and there were trout still popping here and there at 1800. Hirano san and Suzuki san caught serious numbers of trout on dries, I gave up when the body count was in the late teens each, it was their last day and they were making the most of it. A lot of the trout taken this week have been on an opossum fly, as earlier in the week we found a road kill opossum in perfect condition. The Japanese had never seen an opossum but being avid flytiers they soon saw some possibilities, hence the photo of the opossum being shorn with the scissors from someone's vest. The next morning was a slow start as it was wet so we had a fly box conference and Aussie Andrew showed the others his opossum dun. This fly, see photo, is tied in the same way as the wool fly in the 17 March blog, the body is hare's ear and the wing is opossum. The opossum creates the same gauzy, diaphanous wing as the wool fly and I think this is the reason for its success, also they are very quick and easy to tie. Andrew ties his on a TMC 102y #19, these are nice hooks if you can get hold of them as they are in the odd numbered sizes and have a larger gape than the 900BL's. The weather has been terrible since the the great hatch we had on Monday, cold, squally showers that usually arrive right on hatch time. The rises in the afternoons have been poor, lots of mayflies on the water but not a lot of fish up on them. Another unusual feature of the last three days have been a hatch of duns that have started about 1630 and gone until 1800, several people on different parts of the river have remarked on them, it will be interesting to see if they continue. 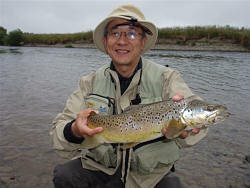 I have been guiding Hirano san, Suzuki san and Igarashi san here for the last three days and in spite of the bad weather they have caught quite a number of good trout. Tonight is an awful night but the weather looks as though it is going to fine up but the wind looks as though it is going to be with us for the next week, at least it is coming from the west and the south west. Andrew Mossman from Australia has also been staying here and is reporting the same sort of hatches, he has been hooking a lot of trout on his claret and starling wee wet, he ties this on a TMC #19 102Y, it has a claret seal's fur body and a starling hackle. The nymphing has been slow first thing in the mornings but seems to pick up around lunchtime, which makes sense as the nymphs are becoming more active prior the the hatch around 1400. I also lost a fly box yesterday below Mataura in the Rodeo ground area, it is a dark grey large C&F and only contains dry flies. These fly boxes float so it could be anywhere, there will be a reward for its return. This afternoon there was a great hatch of mayflies which started at 1400 and went until 1600, this is the normal time span for dun hatches in April so maybe they have settled down to a regular pattern because the preceding three days were patchy to say the least. 22/23 degrees in the afternoon on the river and bright sunshine were not conducive to hatches, whereas this afternoon was cloudy, cool and the mayflies poured off. Yesterday and the day before we were bemoaning the fact that the hatches were poor but when we got home someone pointed out that it had been a beautiful afternoon on the river and we had still caught 3/4 nice trout on dryflies over a couple of hours. The lesson here being that we should be thankful that we can fish when we do and big hatches are not necessarily the holy grail. Although it was good to see them going for it in the ripple water to start with and then they started up in the smooth water above the ripple, you can see the type of water in the background of the photo of Graeme with a good trout. Some people avoid this sort of water thinking it is too difficult but it is not as hard as it looks. I find if you quietly wade out, wait a bit and they will start rising around you, don't cast upstream but find trout that are opposite and slightly downstream of you. Use a reach cast and drift the fly down to them, if you don't know how to do a reach cast Google it and learn it because it is absolutely essential for this type of fishing. Once you have learnt it you will find yourself using it in all sorts of situations as it cuts out drag and drag is a killer on the Mataura. The Mataura has had a good flush through it which is exactly what it needed, it went up to 1300 on Monday and today it was down to 825 so as long as there are no extreme weather events it should be perfect for the rest of the season. I went off to a favourite rise point at 1300, I thought I would allow myself plenty of time now that daylight saving has finished just to see what the new official rise time was. I figured that as they had been starting between 1430 and 1500 an hour earlier than that should be just about right. I sat on the bank and watched as the swallows and terns were obviously taking mayflies but over that hour I only saw one mayfly and just a couple of trout rose. Then by 1400 I thought nothing was going to happen so I left to check one last place before I went home. This place was the same, Terns swooping all over the pool but no trout rising, then right on 1430 it was as though a switch had been turned on, mayflies and trout rising everywhere. I hooked about a dozen trout, not big but in beautiful condition and a good proportion of them were sea-run types like the two below. There has probably been a good number of them that have come into the river after this fresh and April always seems to see a large influx of them. I caught them all on an #18 CDC emerger with a hare's ear dubbed body and on the way home I ran into a mate who had also done well using an #18 red bodied, lamb's wool wing fly that I described in my blog of the 17th of March. With a wee bit of luck this is the pattern of afternoon rises that we will see from now until about halfway through May when they seem to go off, I think the trout start to concentrate more on spawning, although if the weather holds there will be a few that will still rise. We are at last starting to get into the autumn mayfly hatches plus some good spiner falls when there has been no wind. 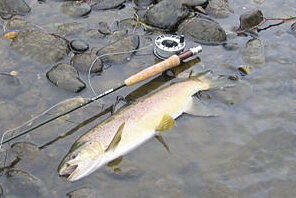 The trout in the photo below was taken in a dun hatch today on a #18 CDC emerger. The dun hatches have been starting about 1430/1500 and the spinner falls anytime, for example there was a good one around Mandeville from 0110 to 1300 on Tues. Although, there have been some dun hatches starting later, a friend of mine said the duns didn't start coming off where he was above Gore until 1600 today. It has been quite interesting talking to people about the look of the duns, some people say they were smokey grey, others that they had a brownish look and some that look bigger and are more black looking. We know that on the lower Mataura they are all deleatidium vernale but as a biologist told me once, there are sub species of deleatidium vernale that have not really been studied and these may be slightly different in colour and size. So the lesson here is to get a good look at what is coming off and pick a fly that is as close as you can get, especially if they are being picky. My friend also said that he has been having more success with a standard #18 adams, rather than the usual CDC, floating nymph and cripple style flies. I have been sticking with the emerger patterns but changing a lot between #18 and #16. There has been some rain and we may get some more but that will do the river the world of good, over the next few days there will be a cooler SW flow which will make for some good dry fly fishing. The small fresh that went through the Mataura a couple of days ago has helped the river a lot, it is now at a good level and much cooler, it was 10 degrees first thing this morning but warmed up 13 later in the afternoon. There have been some good afternoon dun hatches but again it has been a case of finding a sheltered place, any ruffling of the water surface seems to stop the rise. I don't think there is enough dun activity yet to really get them going so if there is too much wind they stop. We have had Hikari Fujimoto here staying with us for the last couple of days, yesterday was tough and I made the wrong call on where to go and we got caught with the wind which put the hatch down, although several fish were caught on dries. This morning was again tough for nymphing and it seems that as the afternoon hatches improve in late March/April the nymphing in the mornings goes off. There are many ripples though where the birds can be seen feeding on mayflies but the trout don't rise to them, I think the trout just concentrate on the nymphs, these can be great if you just want to nymph. I put Hikari into a pool out of the wind this afternoon and he got 7/8 good trout, including a lovely four pounder out of the foam line on his emerger pattern, it was a rise to duns and it started about 12.30 and they went off and on until nearly 4.00. The next few days are for NW/NE winds of varying strengths which is not great and what we need is a cool SW system to get the mayflies going. The SW also gives us more options as far as places to fish go, the NW/NE comes straight downstream and there are not a lot of places on the Mataura to get away from it. The Mataura is still very low but some rain up in the headwaters has put a small fresh through it and the promise of more rain tonight should really help it, it has been too low for too long. It also has not got cold enough to get the afternoon dun hatches really going, although there have been a couple of cracker spinner falls in the last few days. 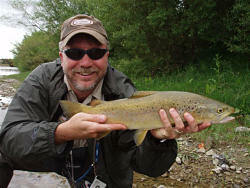 I have been guiding Doug McCoy from Seattle and although he hooked several good fish he really had to work for them. The dun hatches were rather half-hearted and even though he hooked a couple we really had to concentrate on nymphing. Doug caught this beautiful sea-run on a #16 hare's ear nymph, the photo does not do it justice because of the rather dull light but it was bright silver and had an iridescent blue on it's check and flank. It had one spot on it's gill cover and none on the other side and it's body spots are like X's, contrast it with the spots on the resident brown in the net photo. It was the first one we have caught for awhile as there has not been a fresh to bring them into the river, this fish was fresh run so I have no idea why it would have come up. We catch a lot of sea-runs after a fresh and they seem quite easy to catch, you know you have one on because it will usually run you into your backing and be very difficult to bring to the net. The majority of them are in the 1-2lbs range, the biggest I have ever caught was 4lbs but I have had several clients catch trout of 10-11lbs and the biggest was 13lbs caught on an #18 pheasant tail nymph! The last five days have been terrible with strong SW winds, cool and showery but the mayflies have loved it and there have been some excellent afternoon hatches of duns. It is not happening all over the river because a lot of it is too exposed but if you can find some sheltered and semi sheltered spots, go there about 1300 and just wait, you may be pleasantly surprised. I wanted to show you a couple of flies that have been catching a lot of trout over the last week or so of the dun hatches. The one on the left is my mainstay emerger pattern and over all the years I have been using it, it has never had a name, I just call it my CDC emerger. I first developed it 13 years ago after watching Daniel Agar tying the English shuttlecock pattern which is much the same, except the CDC is tied in in the horizontal plane and there is no shoulder. I had trouble seeing his fly on the water so I tied them with the wing upright and I also clipped the CDC to leave a shoulder behind the wing which helps with floatation and that is how I have fished ever since, use three CDC feathers for the wing. It is tied on a #16 TMC 900BL but recently I have been using a #18, it has the smaller body but the wing is about the same size as the #16 so it is just as easy to see but I think the trout like the smaller body. I like to wet the body before use and then after the first trout I leave the body wet but dry the wing and then dry it some more with a quaintly named US product called "Frog's Fanny", you must have some of this if you are using CDC. The second pattern is one that was shown to me by Tetsuo Fukui last Xmas and has been very good especially in the evening as you can use floatant and know that it is floating, sometimes I am never sure with CDC. It is tied on a #18 TMC 100 hook with any sort of body you like, I use Umpqua mahogany dubbing as it can double as a spinner pattern and the wing is made from lamb's wool. I used to use the same fly tied with CDC but it was difficult to tie as the wings could twist and the CDC wings had to be matched up, whereas this fly is very easy to tie. A lamb's wool post is tied in as you would for a parachute fly and then clipped off quite low, this gives the wing some bulk and helps to spread the wing. A piece of wool is then placed under the hook below the post, pulled up on either side of the post, then run the thread once around the front, then the back and then around the base of the wing and the post. Then run the thread back to the tail and put on whatever body you want and tie off. The river is still low but cool and aside from major floods it looks like there will be some great dryfly over the next couple of months. The Mataura has been fishing really well the last week, there was not a lot of wind so there were some great spinner falls during the day. The evenings were still patchy but the last two cool, showery days have seen some excellent dun hatches so as far as I am concerned I will concentrate on the day hatches. I much prefer the more visual aspect of fishing to rising trout during the day than guessing whether a certain trout took my fly or not in the half dark. The nymphing has been very easy too, it is probably because there are a greater number of nymphs in the drift getting ready for the afternoon hatch. I have been guiding Peter Adams and Jesz Fleming, two very pleasant and amusing Irishmen, they are both very early stage fly fishermen but they still hooked a large number of good trout on nymphs. The river is still very low and may remain that way as there does not seem to be any serious rain in sight yet but it will continue to fish well and probably get better as the water should stay cool from now on. The Mataura is now very low, 544 at Wyndham and with a water temperature of 16.8 you might think it would not be much good but it has been fishing well, especialy in the mornings. There has not been a lot of wind and if you can get on the river before 0800 there have been what we think are the tail end of the nightly dun hatches. The evening rises have not been great although I gather it just depends where you are on the river as they are very variable. The duns are not doing anything in the afternoon yet but are definitely hatching late at night but who wants to fish that hatch anyway, they will start in the afternoons as soon as it gets colder. With the lack of wind there have been some good spinner falls during the day but these have been in certain select spots and not all over the river. The low water has exposed some interesting nymphing spots, places that have been previously unfishable in normal flows but are now available and the same applies to using soft hackles. Just get away from the same old places and there are plenty of new ripples and foam lines to be discovered. The two trout below were caught nymphing in a place that would have been no good for nymphing just a few weeks ago. We have just had a few very enjoyable days with Bill Claus and Robert Piampiano from Maine and the weather stayed good in spite of forecasts of rain and wind. The nymphing was very good and they caught a lot of larger trout, 20" plus, mainly on the TMC #16 100 black bead head Hare's ear, although Robert lost a seriously big trout on a double rig of his which he hooked in a shallow ripple that barely covered its back, we all saw how big it was as it lept out of the water right in front of us and broke him off. Bill had a lot of success one afternoon swinging the Orange and Partridge across and down, these were all nice sized trout and it just showed how well wee wets work even during the day. The dryfly was not so good in the evenings mainly due to the weather, it is getting cooler now and the river is at a stage when the evening fishing is going off and the afternoon hatches should start. Most of the trout in the evenings were caught on a swung Orange and Partridge(TMC #16 100), although we hit a genuine dun hatch on the last evening below Wyndham but they were difficult because of a nasty downstream east wind. We only saw a few duns during the day but our best dryfly was a spinner fall on the first afternoon that went from about 1230 until about 1600. They were difficult but they both caught some very good trout, the middle photo shows Robert with one that took him well into his backing and was a good 22". The flies used during the spinner fall were a red bodied comparadun, rusty spent spinner and my upright spinner pattern, all #16. The river is very low at 578 at Wyndham but it is raining tonight which may help, it will certainly cool things down and that should encourage some afternoon dun activity, even though the river is low it is fishing well and the trout are in superb condition. I have been guiding Todd Levine from Rhode Is. for the last few days and we have had some good fishing on the Mataura, nothing big but plenty of good conditioned trout. The evenings were not very good which has been the pattern except for the last one when Todd hooked several on an swung Orange & Partridge followed by a good spinner fall. We thought it was all over as it was fully dark by now but by the time we had walked up to the top of the pool there was a huge hatch of duns going on. Todd hooked a couple on a CDC emerger and we called it a night but the trout were still rising hard as we walked back up to the car. I am not usually this late on the river but it confirmed my suspicions the the mayfly duns are doing more hatching during the night. Some people have been complaining about the lack of hatches during the afternoons in March but as March has been getting warmer over recent years the mayflies are doing it at night. This is still Feb but it is part of a trend, maybe the answer is too get out early in the morning. We did a day at Onslow and although Todd hooked 3/4 which all ran, jumped and got off we never saw a Cicada although I could hear the odd one. I spoke to a long time Onslow fisherman who said it was finished for the year which means that has been two disappointing years up there in a row. The Mataura is at a good level but will get lower, although it looks like there might be some rain on Tuesday. Jan/Feb are not the best months for daytime hatches as it is generally too hot although last Jan/Feb was good as although the river was low the water temp was much cooler than this year. I went out last evening which was warm and calm expecting to see some rising trout but not a fish rose. About 1930 I put on an Orange and Partridge wee wet(see photo) which is tied on a #16 TMC 100 and swung it across and down through the pool above the ripple in the photo. I landed about a dozen stroppy wee trout up to a couple of pounds, the one in the photo would have been typical, after that it got a bit dark for good photos. I love fishing wee wets as it is how I learnt to fish as a child and I still get a thrill when I feel the tug as a trout takes. It is a great way to catch trout on the Mataura and I do it a lot, in the evening with older clients who cannot see the dry, beginners and when there is a downstream wind, I just turn around and fish downstream. It seems to be a forgotten art as everybody now starts off upstream nymphing and I am always surprised at the number of people who have never done it. The last few mornings have had a cooler autumn feeling about them so maybe those afternoon mayfly hatches are coming. We have just had some very welcome rain which has cooled the river, it is now 14.9 at Wyndham and the Mataura has gone up to a very fishable level of 844. I went out this morning and caught several nice trout nymphing with a #16 TMC 100 Hare's ear nymph with a 2mm black tungsten bead head. We have rather neglected the Mataura recently as it has been warm and low but it was nice to see the trout are still in superb condition . I went out again in the afternoon but found nothing rising except the odd one along a few grassy banks I looked at and I caught some on a #16 TMC 900BL parachute adams. I rather expected to find some rising because of the cool showery SW change that came through, I will check the river this evening if the conditions are OK, it would be nice to have some decent evening rises. Below is a shot of the nymph I was using this morning and also a shot of Mike Weddell's Black & Peacock that we used at Poolburn when the trout were on snails. The lure of that lovely lake and those big trout was too much so two days later I took Graeme Clearwater and headed up to Poolburn again. The first morning we got there it was calm and a few trout were rising sporadically but we were unable to hook up so I decided to go to Manorburn and see if the Rainbows were on the Cicadas yet. We managed to find a way to drive from the bottom of Manorburn all the way across the tops to the Greenland reservoir, the views across this vast treeless landscape were incredible. Unfortunately nothing was rising and there was no sign of cicadas, also by now the wind was a minor gale so we headed back down to Poolburn. Luckily Graeme had put the tent up earlier and as fishing was impossible it was a case of early dinner and into bed. We were up before daylight and the lake was like a millpond but nothing was rising anywhere! So we packed up and after breakfast I saw one rising in a shallow bay not far from the camp and on closer inspection there were a lot of trout cruising around. They were on snails as the first one we caught had masses of snails pouring from its mouth but amazingly it had taken a Royal Wulff that Graeme had had on from the day before! We also caught one on an Itoh san beetle which is pictured below, this fly has been great in the few weeks since I was shown it. It is easy to see but due to the parachute hackle and the foam back it floats in the film and not on it and I think it works better. But after that we used Black and Peacocks in #18 Tienco 900BL, these were tied exactly as Mike Weddell does in his book "Ten of the best NZ trout flies". They worked really well but you had to get the fly right in front of the trouts' nose as they cruised past, the water was less than knee deep and the trout had their fins out so their window was very very small, 15cms or more away and they just didn't see the fly. It was very exciting and several beautiful trout were caught but it was all over by 10.00am and as these were the only trout we saw rising we decided to go to a small pond that is full of little Rainbows. It was a lot of fun and although we know there are some big trout in there we didn't manage to hook any. The cicadas were not going on Poolburn but they are under way on Onslow so we will go there in the next few days and check out Poolburn/Manorburn later. This week due to a cancellation I had the rare opportunity to venture out and do something I had been wanting to do for some years. The Poolburn dam and the Manorburn were two places I have never had the chance to fish on my own and the weather being what it was offered me this experience. I packed up prepared to spend a couple of days probably sleeping in my truck so as to be able to fish the late evening as well as the early morning (I must say for me an experience) and headed off. I reached the Poolburn early afternoon there was a bit of a breeze and only a few trout rising but a local fisherman assured me that the wind would die down in the evening and sure enough it did. This was the same guy who told me that the trout averaged 4lbs and sure enough he was right again! Everyone had told me that the evening and morning rise was to midge pupa but I couldn't catch them using pupa so a change to an Ito san beetle pattern bought instant success. They were lovely coloured trout and very strong the first one I got took me right into my backing, I thought I had foul hooked it, I couldn't do anything with it. The next morning as I was waiting in the dark and they started rising just as it lightened up, again they were after pupa, cruising and slurping around in circles but they would nail a beetle if it was in their path. 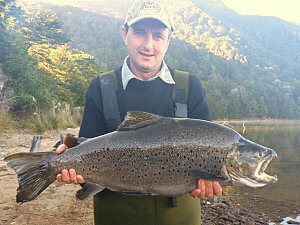 The biggest trout was 61cms and the smallest was 55cms so the local fisherman was spot on. They tapered off about mid morning but there were still enough going to keep me interested. I killed one to take home for the smoker and it was full of Koura, midge pupa, cicada, beetle(green) and other stuff so I don't think they are selective only to the pupa. This was such a fabulous experience and I never got as far as the Manorburn as I had a client this weekend so out of that will come another episode with a bit of luck next week. Peter Lenihan and I went to Lake Onslow yesterday to see if the cicadas had started, traditionally they start around Waitangi day, I was not worried if they had not as I had had great fishing a week earlier using beetle patterns. The hot weather of the last few days had kicked them off though and there were quite a few on the water but the trout were not really up and on them and I did not catch a fish on a cicada imitation. We hooked quite a few but lost heaps, most were in the one to one and a half pound bracket, very pretty trout that fought really well for their size. I caught several much larger trout in a small bay that for some reason seems to hold bigger fish, I caught them on a beetle pattern that a Japanese client had given me and a Cochy-bondhu tied plump on a #14 Tiemco 900 BL. I am off with a client tomorrow for a couple of days to check out the upper Manorburn and Poolburn. The water is getting warm on the Mataura, 20.2 degrees today so we will just concentrate on the lakes and fish the Mataura in the evenings. Aoki san, Ngagaoka san and Yuyama san had a good last day and a half and caught several good trout each, the river had come down a lot but the trout were still feeding along the banks. All of these trout were caught on dries except one which refused dries of all kinds but took a pheasant tail nymph tied below a dry first cast. The big lesson of the week was how well the Mataura fished even though it was high, there are many places where trout will be feeding then but are no good once the river drops to more normal levels. The Mataura is now at what I think is a perfect level of about 750 on the Wyndham bridge site but it is going to drop quickly now by the look of the fine weather coming. The weather looks perfect for the high country lakes so we will have a look up there over the next few days, usually they don't start until about Waitangi day but with the heat we have had they may be under way. We decided to have a go on the Mataura today even though it is still full and there was a predicted hot NW, which never eventuated, not good conditions for the Mataura but it turned out a good day. When the Mataura is still full but clearing I have several grassy banks with a depth of between half a meter and a meter that we fish along blind, no more than a meter out, or sit a watch to see what rises. It was a beautiful day with a light SW and they hooked, lost and landed some nice trout, these bank feeders always seem a wee bit larger than average. We went out again in the evening and even though it was warm and calm it was another poor rise, the evenings were good around Xmas but have been very patchy since. But they still managed a couple on dries and some on wee wets. The Mataura and the other streams were still full and as it was a great day with a predicted high of 25 in Alexandra we decided to go to Lake Onslow and see if the cicadas had started yet. It was pleasant and warm up there but I never saw a cicada, although I heard several so I don't think they will be far away. There were trout rising here and there from about 0110 when we got there and there were some going when we left at 1600. The guys caught all their trout on beetle patterns, they targeted rises or just cast out, let the fly drift in the breeze, walked along and then cast again. The trout were the usual lovely Onslow colour and a wee bit bigger on average than we usually catch, Yuyama san was run out well into his backing and broken off by something big. We went to the Mataura again in the evening but it was a very poor rise so they put on soft hackle or wee wet flies #14, swung them across and down and caught 3/4 each. 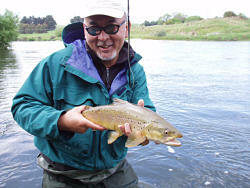 This is a great way to catch trout in the Mataura if there is not much doing and is a lot of fun. Takashi Aoki and his friends' Takayuki Yuyama and Yasuo Nagaoka arrived for four days fishing so we went out for a look in the evening. The river has been up but was starting to go down, although it was still very full at 1165 on the Enviro South site at Wyndham. There were trout rising and they were easy enough as long as the fly went right over them in the murky water, the hardest part was landing them amongst the thistles and the docks, you can see how high the river is in the first photo. They caught several trout between them and pinged a few off using a mixture of CDC emergers and a parachute adams with a pink wing post. Nao Miyajima had a good day on the 21st, he hooked 5 on a #16 black beadhead hare's ear in the morning and then he got two lovely 20 inchers on the same nymph further up the river. I was expecting for him to see some rising trout in the first place but nothing rose all day. We had great plans for the evening but the rain started late in the afternoon and instead of being showers as predicted it was steady heavy rain all night and into the next morning. It has been quite a tough season as far as the weather is concerned, with a lot of wind early on and a lot of rain just recently. But, the fishing has been very good and the trout are in terrific condition so if you can put up with the weather the trout are there to catch. All rivers and streams in our area are high but are coming down fast and should be fishable in about three days, we were catching trout after the last rain at 1000mm + on the Enviro-South weather chart. There are always the high country lakes which should be starting to show some activity, I was talking to a guy who had had a good day at Onslow three days ago using a big Cochy-bondhu. 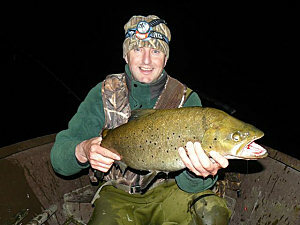 Michael Hartstonge with his first double figure trout, 13lbs of Brown trout caught on a #16 Cadillac nymph! and when the winds in the west, the fishings the best. Probably the SW is the best on the Mataura but whether it was a combination of the hot day and the east wind it was tough! Miyajima san only managed to get six on the Tuesday and another six today and that was nymphing hard. We saw nothing rising anywhere and we were hopeful of an evening rise but nothing much rose although Miyajima san managed to get two, that's me holding one of them. So that is Monday, Tuesday and Wednesday that there has been no rise, it may have been different on other parts of the river but I doubt it. The wind will swing around to the SW tomorrow so it will be interesting to see how it goes during the day and in the evening. 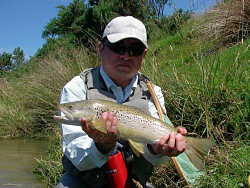 I guided Miyajima san today and even though the Mataura was still high, it was 1025 at Wyndham bridge we still had a good day on the dry fly. It was warm, cloudy and there was no wind, ideal conditions for spinner falls and fall they did! We went to a long slow pool and there were spinners on the water from about 1000 through to about 1630 with a peak of them about 1100 and again at 1430. They were not that easy but he must have hooked about a doz and broke off and missed quite a few others. They were all nice trout in the 2/3lbs range and the biggest was a nice 22" sea-run. We are off to another similar pool tonight where we may get duns hatching as there were very few to be seen today. The Mataura is coming right fast and should be in good shape in a couple of days, in fact I have a client arriving for a week later this afternoon and I am planning to go for an evening rise. I know of a long, slow pool which can fish quite well when the river is full, plus it will be sheltered from this awful east wind. The small streams should be OK in their upper reaches by tomorrow and we will be checking a couple out and then after that the Mataura should be OK during the day in certain places. The rain has done us a favour and it will help the Mataura and other streams from getting too low over the next month. At the moment some very big Browns and Rainbows are being caught in the late evenings and into the dark as a result of a population explosion of mice! This happens every four to six years, sometimes less, when in favourable conditions the Beech trees produce larger numbers of seeds than usual, this is known as beech mast. As a result the mouse population explodes due to an abundance of food, unfortunately so does the stoat pop, later on as the mouse pop. declines the large stoat pop. turns to birds and especially native birds. Some of these large numbers of mice find their way accidently into or maybe they attempt to swim the rivers or lakes and the opportunistic trout take full advantage. This results in some tremendous growth rates for the trout, trout are one of the best convertors of food into bodyweight in a short time on the planet, one trout caught recently had up to 13 mice in it's gut. 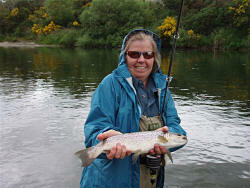 These lovely trout were caught in Fiordland by Paul Stenning on mouse patterns. There has been a lot of heavy rain all over Southland the last couple of days, the Mataura and its tributaries are out and liable to remain so for several days yet, maybe a week if there is no more rain. Just before the rain the Mataura was starting to get tough, there is a transition period about this time of the season when the mayflies stop hatching in the afternoons and hatch in the evenings. The odd few evenings we were able to get over the last week saw hatches of mayflies and the trout were up on top aggressively taking mayfly duns until dark. There will be daytime dryfly activity in the form of spinner falls on warm, cloudy and calm days so when you get these conditions look for the long, slow pools with many willows. The last few days I have been guiding the other Japanese fishermen who have been staying with us and in Mataura and the highlight was my wife Bev's annual New Year's Day Biggest Trout Competition. This has been going for 10 years now and is open to anyone but it is usually the people I am guiding, the Japanese and other people who have houses in Mataura and the guys who guide for me. It is done by length, Bev relies on everyone's honesty and most people take a shot of the trout with a tape next to it. Adachi san on the right in the photo has one it 5 times now and the main objective now by everyone is not so much to win it as to beat Adachi san! 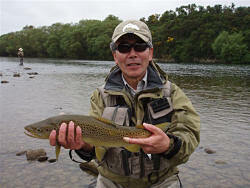 This year Adachi san and 3 others went to the Pomahaka in two cars, Adachi san caught a 53cms trout and came home in his car. There was some confusion as where they were all to meet after fishing but the upshot was that the two cars came home each thinking the 4th fisherman, Konawa san, was in the other car. But the terrible truth was that they had left him behind! A car was immediately dispatched to get him as he had now been waiting for 3 hours but he had used this time to catch a 53cms trout! So if Adachi san had bought him home when he was meant to he would have won the trophy for the 6th time. Instead he had to share the prize with Konawa san, much to everyone's delight! I guided Jun Midorikawa and we went to a place that was known as "Bizen's favourite point", it is a bit of a scramble to get to but even when there is not a rise there are always some trout rising. Sure enough there were three going in the foam line and Jun got all three of them on a CDC emerger. They were not easy as they were moving around and he had to put many casts over each trout but when the fly went over their head they took it without hesitation. This was an object lesson in keeping at a fish, often Mataura trout when they are feeding are moving and very close to the surface so they have a very small window. Consequently even though a fly may land several inches from a trout they just don't see it until one floats right over their head! Jun hooked and missed several others fishing blind along a bank with a small caddis but as far as rising fish went it was a tough day. The evening was completely different and they started rising to mayflies in this long, slow pool about 2030, they were feeding aggressively and Jun caught 4/5, again on the CDC emerger. Guided Shibuya san, Horiki san and Yoshino san for a couple of days, the river is still tough for dryfly during the day although we got into a spinner fall that went all afternoon in light rain. Even though the afternoon dun hatches are rare in Jan/Feb if it is warm, no wind and cloudy you can get some superb spinner falls. These conditions replicate those of the evening when the spinners usually fall, the thing is to make sure you are using a red bodied fly when there are spinners on the water. The spinner of the deleatidium vernale which is the common mayfly on the lower Mataura has a brilliant red body and the trout lock onto this feature. We have just had Kobayashi san, Kenji san and Nobuyuki san here for three nights but the river suddenly turned very tough. The afternoon hatches just stopped although the evening rises were brilliant. Usually the afternoon hatches stop about Xmas time as it starts to get too warm and the mayflies do their hatching in the evening. We even went looking for rises to willow grubs on the Waikaia to get some daytime dryfly but we couldn't find any. Maybe the cool weather has delayed them but we soon found some on one of the smaller streams. I think they were only just starting as we got them on patterns other than willow grub. They got trout nymphing during the day but the highlight was the fabulous evening rises which were starting about 1930-2000. These were all dun hatches and the trout were feeding aggressively and they were not as difficult as they can be on spinners. They were using a mixture of CDC duns and CDC emergers. Jack and Jeanne from Colorado had a couple of days on the Mataura and the wind was gale, Jack and I had to hang on to Jeanne as we crossed a paddock to the river into the teeth of it! But there are some places you can get away from the wind and we found a few. We got some on nymphs and in really shallow water which always surprises people because I don't think they believe me when I tell them to put their first cast into ankle deep water! We then went to a sheltered pool to have lunch and wait for a hatch but while we were having lunch we could see them rising along the willows in water less than knee deep. Jack got 2 very nice 20" trout along there on his green bodied #16 comparadun, this is a fly I don't use much, let alone with a green body but I was most impressed. There was a small hatch about 1500 and he and Jeanne got some more but Jack had a lot of fun fishing to some big trout in a foam line. It was a tough long cast with the wind but he got one lovely 54cms trout on his comparadun. 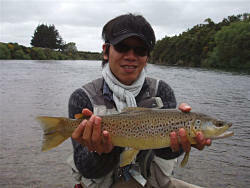 I have just had 5 days on the Mataura with Tsukasa san from Tokyo, he was a top fisherman and he did well on the dry. The hatches are still going well and they are starting anytime from about 1300 until about 1500, if they haven't started by then you are not liable to see one. The first afternoon we got into a good hatch on the lower river and he hooked 5 but the weather was no good for an evening rise. I always take my clients for an evening rise on top of their days fishing if the conditions are suitable but all the time Tsukasa san was here the wind never stopped blowing hard! The next day was tough, for some reason the river was dead, although the conditions were perfect for a hatch. He hooked some on nymphs and he got one difficult trout under a willow branch on a beetle pattern, we were really chuffed with this fish as it was a difficult cast and we had tried several different flies before it happily took the beetle. The following days were good, the nymphing in the mornings was excellent and there were good rises in the afternoon but the strong winds stopped any evening fishing. He landed 43 trout and missed and lost others in pretty horrific wind conditions so we were pleased with the result. 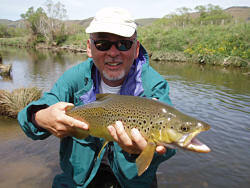 The last couple of days I have taken Hashimoto san to the Mataura and a small stream. We are still getting good afternoon hatches on the Mataura if we can get away from the wind, it has been terrible! He had one wind less day which we spent on a small stream and he caught several trout in this size range which is quite amazing for such small water. The Mataura trout were all on dries but we used nymphs in the small stream, it was a matter of ambushing these large Browns as they cruised past, it was a lot of fun and we missed more than we hooked. 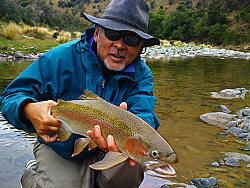 We have just returned from a few days up in North Otago, the stream has dropped a lot since we were last there and the numbers of Rainbows are much fewer, in the low water they were quite difficult but any we found rising were quite easy. The Rainbows are not huge here and most run from 4-5lbs with some up to 6lbs but it is all sight fishing and we only ever use dries so it is a lot of fun. They actually get quite selective at this stage of the season and Hashimoto san even had to go down to a #16 Mataura emerger! Every year we make a several day trip up into a North Otago stream to fish for the rainbows but to our surprise this fresh sea-run Brown was caught on a #14 Adams! 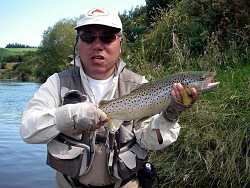 We know Browns are in this stream and several years ago a Japanese client caught an 8lb Brown but this was a definite sea-run. This stream holds many post spawning rainbows which drift back to the main river in December but a small resident population remains which provides for some challenging fishing. I went fishing with Kevin Ireland, John Dean and Peter Lennihan, it was a great day and everyone caught fish. We each took a beat on a long stretch of the lower Mataura. I took Kevin into a hot drop off just before the afternoon hatch and he nymphed 6/7 nice trout out of it, that's one in the photo. I walked on down about 1300 and saw a rise in a shallow ripple and when I walked down to cast to it I could see other trout swirling in the ripples. I took 6 nice trout on a CDC emerger out of this ripple that would be no deeper than my boot tops and no larger than an average lounge room. It was an object lesson in just how shallow water good sized Mataura trout will feed in. Richard and Rob arrived from the North Is just in time to hit the first snowmelt in the Mataura after we had had a fabulous Oct with none. Our mayflies love cool, showery type weather but they don't like snowmelt. They don't mind cold water but a hint of snowmelt and they cease any activity. So it was a case of nymphing, which on the Mataura can be quite productive and over the 4 days they were with me they caught quite a few on the nymph, I think we only got a couple on the dry. 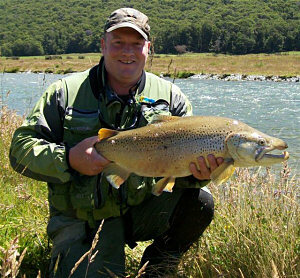 The trout are in great condition for this time of the year and put up a great fight, the two trout in the photos are typical Mataura Browns. They used #14 Pheasant tail and Hare's ear type nymphs and sometimes they would hang a #18 of whatever took their fancy 8"-10" from the bigger nymph. Over recent years I have taken to tying the smaller nymph through the eye of the other hook instead of from the bend, I find for some reason they don't tangle as much and also the trout has a clear shot at the bigger nymph. After having such a brilliant start to the season through Oct. we finally got some snowmelt which although it did not make the Mataura unfishable it did affect the good mayfly hatches we had been having. The mayfly on the lower Mataura( deleatidium vernale) loves cold, showery, SW conditions and does not mind cold water temperatures, it seems to shut up shop when there is snowmelt in the river. The river has got over that in the last few days although there is some more snow up there yet. The hatches started again on Monday and have been excellent with mayflies dribbling off all day with a peak anytime from 1330 on. The ripples are the best place to look and you will find the trout are in unbelievably shallow water, I had a client on Wednesday take 6 nice trout out of a ripple that was the size of an average lounge and not much more than ankle deep. Most people walk right past these ripples but take a few minutes to watch it and you may see a head pop up. The rises in this water are barely discernable and sometimes all you will see is your fly disappear. The brown beetle has also made an appearance in the last few days and a favourite tactic of mine is to fish these ripples in the absence of a hatch with a beetle pattern, just the same as if you were nymphing the ripple. Also it is worthwhile to fish any banks with half to a metre of water and only out a metre from the bank with the beetle. Please note that these reports only refer to the lower Mataura from Gore down. October was unusual on the Mataura this season as normally the river is full of snowmelt and does not come right until the end of the month. The normal practice is to fish various small streams until the Mataura comes right but this year for the first time since the 99/2000 season we were able to fish it from opening day and it was fabulous. We have always known that there were great hatches of deleatidium vernale mayflies during October but getting at them because of the usual high water has been the problem but this year, wow! During Oct/Nov and Dec the mayflies will dribble off in the ripples all day with a peak maybe late morning and again at mid afternoon, unlike the autumn when there are very intense hatches only in the afternoons for one or two hours. So you can pick on a favourite ripple and stay there all day if you wish, aside from the obvious hatches trout will betray themselves with very subtle rises or you can fish through a ripple with a dry much as you would go through it with a nymph. The trout are in good condition for the early season and very strong, they will put on a bit more depth over the next few weeks. 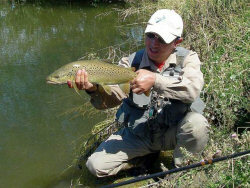 I have not done any nymphing as the dry fly has been so good but reports from friends tell me it has been good. I have been using mainly CDC patterns and parachute adams in the ripples, all these flies are in #16. There is no need to use anything bigger than #16 and I only go down to #18 when conditions are low and the trout are picky. The last week has not been very good as the snowmelt that we should have got in Oct has been dribbling down but it is dropping fast now. Nov can be great as the mayfly hatches will continue, plus from about the middle of the month the brown beetle should start making an appearance. This will really improve fishing in the small streams and a beetle pattern should also not be neglected in the Mataura. If there is no surface activity a beetle fished blind through the ripples or along a bank can generally bring a strike.